Drive along Hwy 84 in the Santa Cruz mountains and you’ll come across the occasional Grateful Dead flag flapping in the wind, a reminder that this area was once the stomping ground of Ken Kesey and the Merry Pranksters, and their Hell’s Angels friends (in nearby La Honda). 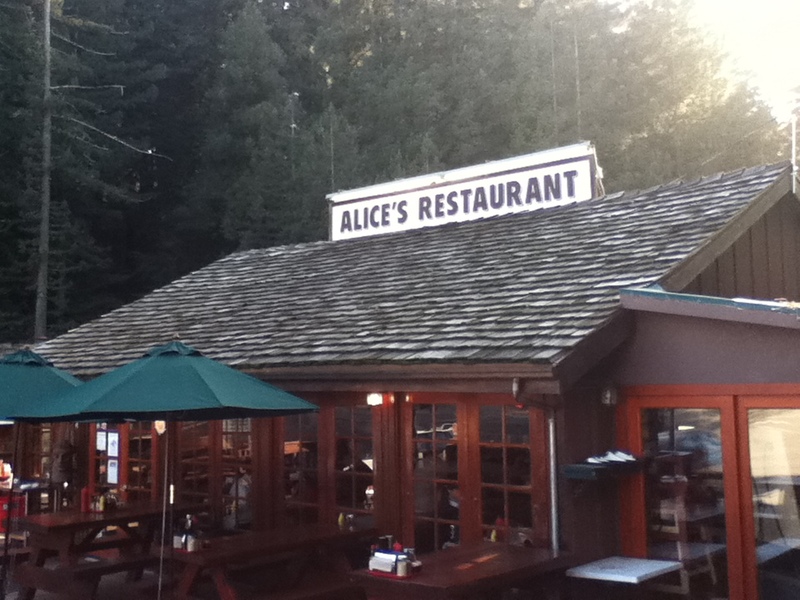 Just up the road where Hwy 84 meets Skyline Blvd (Hwy 35), and fitting right in with the counter-culture vibe is Alice’s Restaurant, named for Arlo Guthrie’s ’60s anthem. And just like the song (and the menu) says, apparently you can get anything you want here, within reason. The food at Alice’s is decent – your basic diner-style omelets, sandwiches and burgers. But the real point of coming, besides the journey, is to relax and enjoy a cold beer and wile away the afternoon under the redwoods, feeling you’re in the middle of nowhere when really you’re just an hour or so from the city. It’s a long and windy road to get here, which makes it a popular destination for bikers and bicyclists, especially on the weekends, but it’s a beautiful mountain setting once you do (and actually a nice drive too). There’s lots of picnic tables outside, and a large sunny lawn for the kids to run around on. And if you happen to come on a Thursday night they have live acoustic music, where you may even get to sing along to an Arlo Guthrie cover or two.